Matches sent! 682 total entries. Check your inbox for your match! People from 20+ countries have joined the fun since 2015, and we're back for more! Join us, send some kitty-love, and receive more kitty-love! secret #SantaHunt 🎄 keeps on giving. We're bringing these to next @ProductHunt team @soulcycle. Scroll down and you’ll find a form. You can write your name, address, and the things you love - maybe a wish list too - so your Secret Santa Paws knows what to gift you! Registration closes on December 18th. On December 19th we’ll start matching each person with their Secret Santa Paws. We’ll send you an email with your match’s info so you can send that person a gift they’ll love. 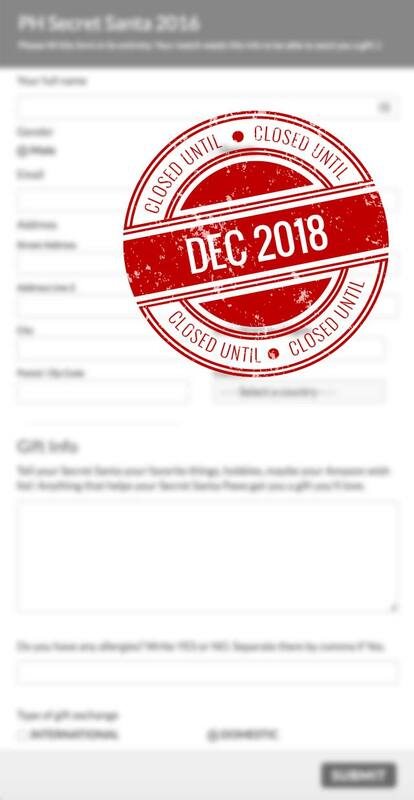 Make sure you check your Promotions and Spam folders on Dec 19th! Now, we wait. You’ll be super excited because you will receive a gift from your Secret Santa Paws, personally delivered by the PH Kitty! (Not really). We love gifts. Who doesn't?! But there's one thing we love the most: Spreading love and kindness. And well, we already spend all day surfing the interwebz, window-shopping Product Hunt and what not, so we thought it would be awesome to host this with the help of the awesome Product Hunt Team, and make some friends in the process! What if my match does not give enough details and I don't know what to buy them? Along with your match's details, we'll include their email so you can contact them if you want, to ask further questions about their hobbies, tastes, etc. You can even send the email from a new email address to keep your identity anonymous ;). What if I never get a gift? Unfortunately there's no way for us to enforce people to buy gifts for their matches and we can't guarantee that you'll get a gift. However, we are confident in the Product Hunt Community and its values. The PH community is one of the strongest in the interwebz! Fear not! You'll get something awesome! Is this an official Product Hunt event? Nope, this is a community-made project. However, the entire Product Hunt team loved the idea and they are supporting us with whatever we may need to make everyone happy. Is there a set minimum value for the gifts? We recommend a price of around $20 - shipping included. But of course, you can go as high and as wild as your caffeinated self wants. Why are there 2 types of exchange? International and Domestic? International means you'll be matched with someone from another country, and National means you'll be matched with someone from your own country. For people manually shipping gifts this is important. If you are using Amazon to ship the gift to your match, then you can buy a gift from their countrie's Amazon website directly and ship the gift right away. Can I enter both the International and Domestic exchanges? For sure, you'll have to fill the form 2 times. Your records will be independent and you'll get 2 different emails with 2 different matches. Oh, you know... just 3 stray cats, living on the streets of the cyberspace, keeping us warm with old Donald Trump tweets. We are a Designer, an Illustrator and a Developer that had the pleasure of meeting each other thanks to the community around Product Hunt. We just thought this would be a cool and fun way to give back to the community 🙌. SEND A TWEET TO SADOK IF YOU HAVE QUESTIONS OR ANY PROBLEMS AT ALL!